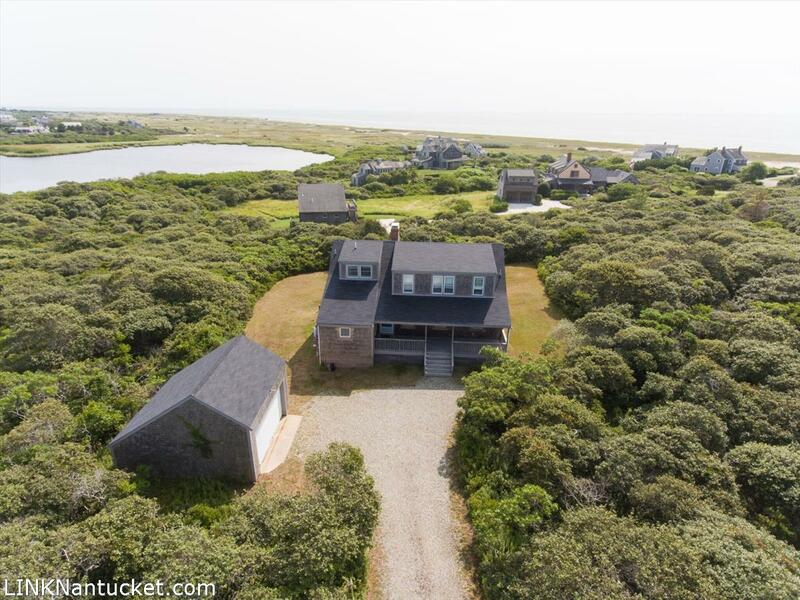 Exciting opportunity to enjoy breathtaking views of Tom Nevers Pond to Low beach and the Atlantic Ocean beyond from this well maintained four bedroom, three bath home. The views from the first and second floors, and especially the back mahogany deck, are not to be missed! All on 1 quiet acre, with a separate 2 car garage. Close beach access off of Sandsbury Rd or via the land bank stairs at the end of Wanoma Way. First Floor: Enter through the front porch into the large living room with two seating areas, fireplace and access to the back mahogany deck, through the sliding glass door, where you can enjoy the sound of the nearby surf. Open dining area with bay window. Eat-in kitchen. Cozy den/TV room. First floor master with full hall bath (tub/shower). Enjoy the spectacular first floor pond and ocean views from the open living and dining areas, master bedroom and deck. Second Floor: Bedroom to the left of the stairs with full bath (stall shower). To the right of the stairs are two additional good size bedrooms and full hall bath (tub/shower). Enjoy fantastic second floor pond and ocean views from the two back bedrooms and hall bath. Basement: Full walkout basement with access to the backyard and patio from the sliding door. Extra storage room and laundry.